This newly expanded edition of Beyond Talent provides user-friendly real-life advice, examples, and perspectives on how to further a career in music. 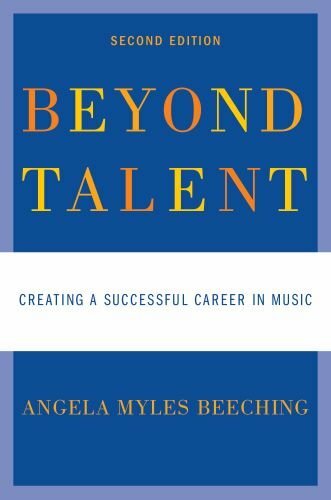 Understanding the unique talents and training of musicians, veteran music career counselor Angela Myles Beeching presents a wealth of creative solutions for career advancement in the highly competitive music industry. Step-by-step instructions detail how to design promotional materials, book performances, network and access resources and assistance, jump start a stalled career, and expand your employment opportunities while remaining true to your music. Beeching untangles artist management and the recording industry, explains how to find and create performance opportunities, and provides guidance on grant writing and fundraising, day jobs, freelancing, and how to manage money, time, and stress. The new extensive companion website puts numerous up-to-date and useful internet resources at your fingertips. This essential handbook goes beyond the usual "how-to," helping musicians tackle the core questions about career goals, and create a meaningful life as a professional musician. Beyond Talent is the ideal companion for students and professionals, emerging musicians and mid-career artists.